Jamie Wright says his first job as Wellingborough Town boss is to convince Jake Newman to stay at the Dog & Duck. Wright and newly-appointed assistant-manager Colin Cooper are taking over from Joe Smyth and Steve Herring, whose spell at the club ended with last weekend’s 7-0 loss to AFC Rushden & Diamonds. Wright has now taken over and knows the club well after he started his playing career there before having a successful 18-month spell as assistant-manager to Craig Adams when they lifted the Doughboys away from the Premier Division drop zone. 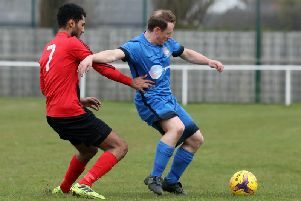 They left to join Bedford Town in January last year but, on his return to the Doughboys, Wright says his priority is keeping Newman, who hit 25 goals in the Premier Division last season, at the club. Wright said: “I’m going to meet Jake, tell him what the plans are and see what we can offer him. “He wants to be challenging in this league and that’s what I want as well. “Hopefully he will see the ambition we have and stay. Wright says he’s also looking to bring back some of the players who lifted the Doughboys up the table when he was assistant to Adams. He said: “I’ve helped take Wellingborough up to fifth in the table before and I believe I can do it again. Desborough Town will look to extend their unbeaten run to five games at the Waterworks Field tomorrow (Saturday). AFC Kempston Rovers are the visitors for Ar Tarn’s penultimate game of the season before they face Newport Pagnell in their final one on Tuesday night. Desborough can finish in 12th place by winning their last two games and boss Ian Walker said: “That’s our target. He will pick from a full-strength squad on Saturday.